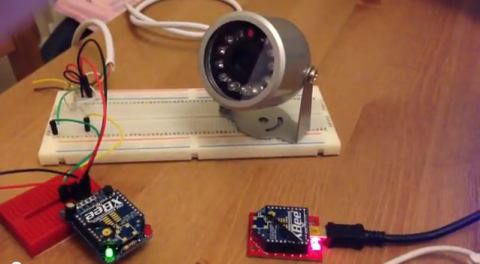 TTL Serial Camera to Xbee to PC – The Simplest Wireless Camera Ever? I’ve been playing and prototyping the cheapest way to create a wireless camera MESH network and I don’t think this solution is far off… no micro processor at work here just serial and a Serial TTL camera. This entry was posted in Micro Electronics, ZSL - Instant Wild (Eye SPi) and tagged arduino, instant wild, London Zoo, Micro Electronics, radio, Raspberry Pi, xbee, xbee radio. EyeSPi mention from Pete Lomas!